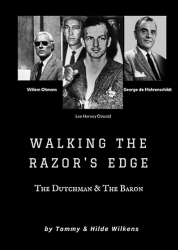 "Walking The Razor's Edge: The Dutchman & The Baron" is a riveting new book written by Tommy and Hilde Wilkens of Roanoke, Virginia that will step by step unfold the story of journalist Willem Oltmans and his life and his journalistic work concerning George de Mohrenschildt and his friendship with Lee Harvey Oswald, accused assassin of President John F. Kennedy. Roanoke, VA, March 08, 2019 --(PR.com)-- Who was George de Mohrenschildt and what was his involvement in President John F. Kennedy's assassination? As the many layers of his carefully-constructed public persona are peeled away, the list of answers to that question begins to grow exponentially longer. It is quite possible that no one person was allowed to know the man in his entirety. But through the dogged determination of Dutch investigative journalist Willem Oltmans, a picture slowly emerges of a shadowy figure undoubtedly connected to some of the most significant events of his time – a soldier of fortune and expert keeper of secrets. This book details a ten-year period of fascinating interplay between a reporter chasing the biggest story of his career and a man of great mystery, deeply conflicted by what he knows and his need to unburden his conscience. The intertwined lives of these two strong-willed men include moments of triumph and tragedy occurring on a scale that the average person cannot imagine. Both are victimized time and again by circumstances they cannot control. Which of them will prevail in the end? And at what cost? The International Review of Books of Dublin Ireland has awarded "Walking The Razor's Edge: The Dutchman and The Baron" the Gold Badge Review saying, "This book is a highly recommended and thought-provoking read. This riveting story takes the reader on a wild roller coaster ride along with Oltmans as he tries to reveal the truth about the assassination to the American public. This book provides well written and well researched new insights into a very controversial subject matter. It is difficult to determine which is more captivating, the author's storytelling skills or the actual story!"